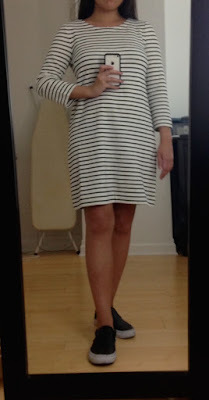 Today's post is a quick review for two items that I recently tried on from J.Crew Factory. I ordered these for about $26 each during a recent additional percent off sale. 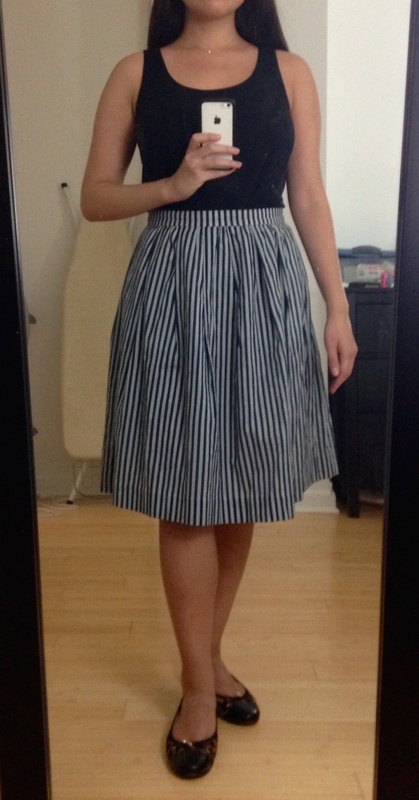 This is my third time shopping at J.Crew Factory, with their graduate student and entry-level professional-friendly price point, and while their wool sheath dress didn't fit me well (my review here), I quite like their breton striped shirt (my review here) and now this striped midi skirt. For fit reference, I'm 5'3'' and roughly 36''-26''-37''. To the left, I'm wearing the Factory Striped Knit Dress, size S, in black stripe. The 97% cotton and 3% elastane material is about as thick as that of the 100% cotton breton striped shirt, but a bit softer and stretchier. It runs big: I would likely need a XS here, as the S has noticeable extra fabric at my hips and is roomy everywhere else. I'm typically a S in all the J.Crew Factory tops I've tried and was in the M size range for their fitted wool dress. I returned this because, while its comfortable and the material and quality seem good for the price, it doesn't have a place in my wardrobe. The material's too thick for my preference in humid and sticky NYC summer weather, even if its mostly cotton, and I don't see myself wearing it with the black tights I generally wear throughout fall and spring. To the right, I'm wearing the Factory Striped Flounce Skirt, size 6. To get the intended slightly above the waist fit, I probably should have bought size 4, but I sized up for comfort and because I don't like when my skirts sit that high. The waistband of the 6 generally rests right at my waist or a little lower. The only colorway for this skirt is labeled "black white stripe," which, as the reviews point out, is inaccurate. Worn with my black Everlane Ryan Tank above, its clearly navy and white. The skirt and lining are both 100% cotton and feel light and summer-friendly. When zipping it, I often think that it feels flimsy, but I might just be unaccustomed to zipping up a skirt that's a light summer piece. (All my other skirts with zippers have synthetic outer fabric or lining except for one J.Crew cotton skirt somewhat similar to this, but heavier because of having even more pleating that's sewn in.) This skirt is also machine washable, which is great. This totally isn't the more formal solid-colored midi skirt I dreamed of, likely this one from White House Black Market, with my goal of finding something similar to the one worn so fabulously by Adina. This skirt was a nice low-cost way to experiment with the silhouette. While I enjoy wearing this, I'm not sure the experiment is a success. I generally find this and other full a-line skirts unflattering, though there's a chance I'm just being nitpicky and critical because I'm unaccustomed to the shape. I generally feel like full a-line skirts are just less flattering on my waist than pencil skirts and the side view of this one is a bit awkward. 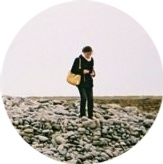 Although my intention with this year's shopping budget was to upgrade my work wardrobe by relying more heavily on secondhand shopping through Ebay or TheRealReal, I've had a hard time making the leap. With secondhand shopping, my general goal is finding higher-quality items which, even after the discounts from being bought secondhand, are generally pricier than items I typically buy. There's also the added risk of buying items at that higher price point from Ebay (no returns!) or even TheRealReal (decide within 14 days, ship within 21, you pay return shipping by whichever method you choose, not to mention the $11.99 shipping fee for each order). and I find TheRealReal's product measurements generally strange and likely inaccurate. This is despite previously having a good shopping experience, when I bought an Equipment blouse (similar) and a Diane von Furstenberg wrap dress (similar) last February after verifying size information on blogs and other retailers' sites. That difficulty is compounded by my impending clerkship pay-cut: While my $170/month budget allows for judicious designer purchases on TheRealReal, I'm not actually sure its wise to spend all of said budget while clerking. Has anyone else had trouble with following through on a plan to spend more on fewer items as a way of upgrading one's wardrobe?